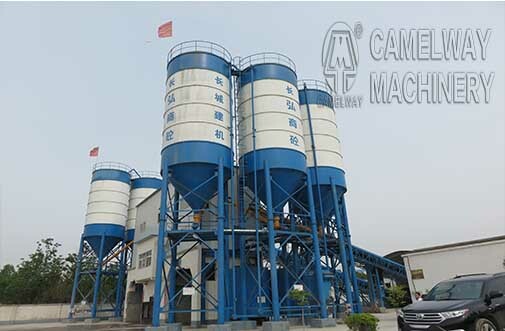 The quality of the concrete batching plant and the operation stuff will affect the concrete quality directly. However, not all the properties of the concrete are determined by the concrete batching plant. Today, I will introduce a property of concrete batching plant which is not influenced by the concrete batching plant, that is, plastic elasticity. The plastic elasticity refers that the concrete produced by the concrete batching plant just now is in a plastic state. Because of the big wind, high temperature and some other reasons, the moisture of the concrete will be drained and evaporated gradually, which will make the concrete in the plastic state begin to shrink, namely, the phenomenon of plastic elasticity. If we ignore the concrete which is in the plastic state and just follow with its shrinkage, then it will lower the moisture content of the cracked concrete and influence the quality grade of the whole concrete. If this is a special engineering project, it will influence the safety of the project directly. Therefore, we suggest that for the concrete which is still in the state of plastic, we should try our best to place it in the environment of low temperature and avoid the evaporation of the concrete because of the temperature difference and big wind. If you want to know some information about concrete batching plant, you could contact us, and we will give you the best service and answer. Welcome to contact us.